Have you been considering adding a fence to your home? If so, a privacy fence is a great option that you must consider. Have you been considering adding a fence to your home? If so, a privacy fence is a great option that you must consider. Depending on your home, local regulations, and needs the best fence for you will vary. However, a privacy fence fits almost every need and is an excellent fit for most homes. Today we’re sharing our top five reasons you should put a privacy fence at the top of your list. If you have noisy neighbors or live in a high noise area, like near a busy road, you may find that the ambient sounds interrupt your ability to relax in your home and yard. 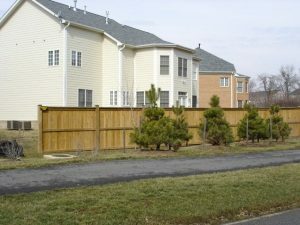 Privacy fences act as a sound barrier that can help reduce this problem significantly. Adding a well built and cared for fence adds an instant level of charm and character to your home. When painted and stained, a privacy fence can become a central part of your home’s landscaping. Additionally, the added curb appeal cannot be neglected. Houses with well-maintained privacy fences are in high demand, and the return on investment is high. Privacy fences make it difficult for intruders of any variety to make it into your property easily. Whether you’re trying to keep landscape ruining deer or would be thieves away, a privacy fence is a great way to amp up your home security. Any fencing you choose will need maintenance to ensure it is long lasting. Wood fences need occasional cleaning and varnish to keep the wood healthy and looking its best but otherwise, require little care. Privacy fencing can also be made with aluminum and vinyl, each has their own needs but neither need to be painted regularly. When it comes to the effects of weather on your landscaping, a privacy fence can help reduce many of the problems. Because it acts as a barrier to wind, it can prevent damage and snow drifting. Depending on the angle and location, your privacy fence may also create a perfect sun blocker and allow for a valuable shade that will make for a great relaxing space in your yard. This entry was posted on Friday, February 1st, 2019 at 2:58 pm. Both comments and pings are currently closed.